We have made it to week 4. Very happy once again be one the Interior Designers participating in this fun One Room Challenge hosted by Linda from Calling It Home and this time around Better Homes & Gardens. The last few weeks I’ve been doing the One Room Challenge updates via Instagram but in case you missed the last posts, here are the links to week 1, week 2, & week 3. I can’t believe I’m doing this again only a short half a year after my first One Room Challenge. Visit the reveal and the previous posts of the Spring Challenge if you’re just joining us. To see fellow participants and to follow them along visit the One Room Challenge page. 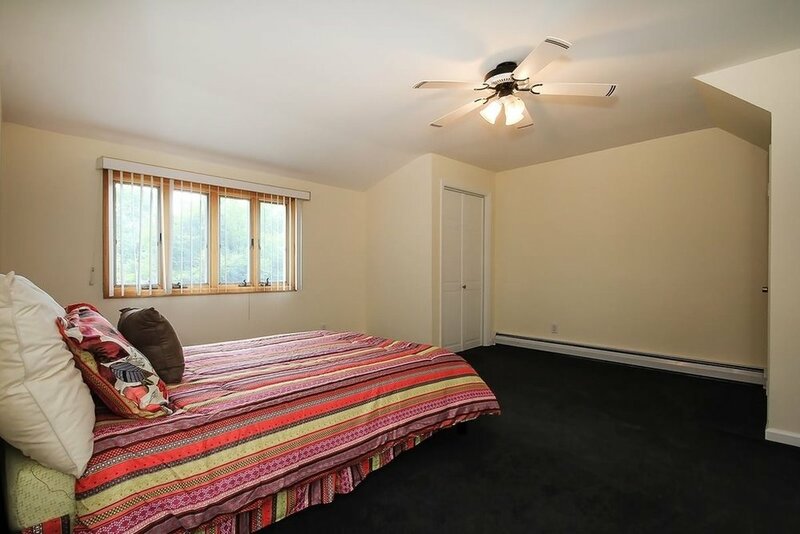 the before photos of the guest room. The first the listing photo and then the after carpet removal photo. First things first the blue carpet had to go and then the fan of course followed by those vertical blinds and we are off on our way to update this space. Just fell in love with the carved headboard and using it to lead the way in terms of the mood of this room. Lighting is one of the most important aspects of design and one of the first things I thought about when starting this challenge. West Essex Lighting Studio agreed to sponsor me for this challenge and I’m so thankful for their support. They have been a pleasure to work with and I already look forward to working with them on future projects. Their storefront is charming and inside is a treasure of many lights. I really wanted a particular kind of light that I fell in love with months ago but it is not in stock until January which is certainly not going to work with this challenge so we had to find something just as interesting. We have chosen very fun table lamps that are going to be a unique feature of the room. Will reveal which light I decided on next week so stay tuned. You can see some of the options that i was considered on my recent IG post. Thank you so much for sponsoring this One Room Challenge West Essex Lighting Studio. Visiting High Point Market last week was a blessing and a curse when it comes to the One Room challenge as it meant that many days were spent not working on the challenge but of course seeing all the beautiful showrooms was really inspirational. The best part was running into fellow One Room Challenge participants especially the amazingly talented Linda Holt who is a featured designer second time in a row this year. Had a blast taking a photo with her and chatting all ORC. Love following her along and can’t wait to see her reveal this season. Just loved picking up our photo the next day at The Point, so fun to see the images posted on Instagram as classic prints and the best part was seeing the fun photos of our many colleagues hanging next to our pic. 1. The focal piece of this space is the carved headboard and it’s already hanging on the wall. 2. The bed is in place is well. It’s a simple white frame with clean lines and contemporary feel. 3. The rug is an antique rug that has been sitting in storage for more than 5 years and is finally getting a good cleaning. It’s ready to be picked up and I can’t wait to try it out in the space. 4. The ceiling light is being repurposed from a previous home and the bedside lamps from West Essex Lighting Studio were just selected as I write this post. Can’t wait to see the lights in person when I pick them up since I selected them from a catalog. 5. Night stands are still needed as well but after much time looking for bedside tables, I feel like I have to get a little creative with this part. The regular nightstands just don’t feel special enough for this space. 6. I also want to add a luggage rack. One of my pet peeves is not being able to find a place to rest my bags when I stay in a guest room or hotel. 7. Most importantly I am still undecided about window treatments and this is where I feel the time pressure for sure. 8. Of course we will need plants, artwork, accessories and more! I did order a couple of prints for the room (sneak peak below) but have yet to find the frames. I’m sure there’s tons more. What are some of the must haves for you dear reader when staying in a guest room? Feel free to share below in the comments section. Hi. I'm Marina. I'm a NY State certified interior designer and certified Feng Shui practitioner. Receive my blog posts straight to your inbox. Awesome. You will now receive notifications when I post new articles. Thank you for visiting. Don't forget to connect with me on instagram, facebook and to sign up for my blog. Now is the perfect time to get the guest bedroom ready for the holidays. contact me today!